A schematic representation of the flagellar components of Salmonella enterica serovar Typhimurium, in cross-section. View a larger image. The flagellum, which provides locomotion for the bacterium, is a long helical structure that is shown in abbreviated form at the top of the drawing. Locomotion is achieved by rotating the flagellum. The apparatus at the bottom of the figure, shown in cross-section, is the motor. The motor is approximately 150 Å in diameter. For reference, an oxygen molecule is approximately 3 Å in diameter. The structure itself is a marvel, but even more wondrous is the process by which it is built. That process is the topic of the paper from which this figure is drawn. As described by F.F. Chevance and K.T. Hughes, the proteins required are manufactured within the cell, and passed along the portions of the apparatus that have so far been assembled. As the different components are completed, chemical signals are fed back to the cell with instructions for what proteins are needed next, and what proteins are no longer needed. This complex choreography is a sequence of messages — requests and responses — that results in a complete motor and flagellum. 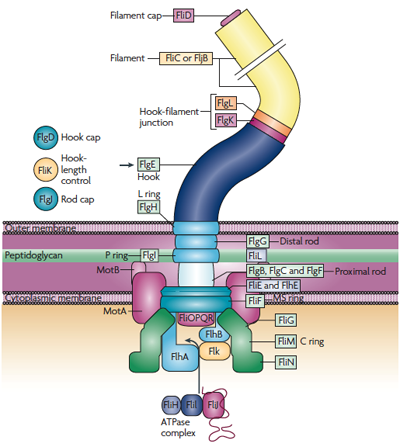 The sequence of requests and responses that builds a flagellum and motor would fail utterly if any element of the system decided to over-deliver. That is, if, say, the cell body decided to anticipate the needs of the flagellum under construction, it would deliver proteins that could not yet be used. Or, if used, they would clutter the "construction site," resulting in malformations and a non-functional motor assembly or flagellum. Nature and evolution have solved this problem by inhibiting over-deliveries of the kind discussed here. People in organizations must learn to do the same. The image is from Chevance F.F. and Hughes K.T. "Coordinating assembly of a bacterial macromolecular machine." Nature Reviews Microbiology. 2008,6:455-465. When asked a question such as "Is that correct?" some of us embark on paths that create trouble in our working relationships. For example, suppose Jan knows that the premise isn't correct, because she knows of at least one counterexample — call it X. Instead of responding, "No, it isn't correct, because of X," she begins forming a mental catalog of all possible counterexamples. If Jan receives the query in conversation, she pauses while she assembles her response. If she receives the query in email, she takes a day or two to do research. That's why it takes Jan longer to respond than the person who asked the question expects. Often, people interpret these delays as shiftiness, evasiveness, or secretiveness. They might see her as being careful in her words, or plotting, or scheming, or taking time to manufacture lies or misleading responses, or lacking in confidence. Questioners who fairly evaluate her responses are much less likely to make these erroneous conclusions. But some questioners don't want the complete responses Jan always delivers. Questioners who ask, "Is that correct" sometimes don't want a full catalog of the reasons why it isn't correct, and they ignore it when she delivers it. Their preferences thus lead them to misunderstand what takes Jan so long to respond. By over-delivering, some people, like Jan, convey the impression of being untrustworthy, scheming, reluctant, or incompetent. When asked for an opinion or judgment, and the request doesn't specify a need for a complete or absolutely reliable response, a partial and estimated response — delivered right now — might suffice. If you're unsure, deliver the short answer, then ask. If you know one reason why it's impossible, that might be enough. Offer it and ask if more are needed. Can you do it by Friday? One reason why you can't might be enough. If you know one possible explanation, provide it, acknowledging that it isn't 100% certain or complete. Who do you think can do this? This is a question about capability, not availability. A complete list might not be required. Can we do this for under $X? reluctant, or incompetentyes-or-no answer. Yes can require significant research. No can be very easy. Who told you that? Or: Where did you hear that? A complete list isn't required. It might not be necessary to provide the date on which you were told, or the order in which various people told you. Would any changes be required to meet that requirement? If you know of one, then the answer is yes. You don't necessarily need to devise a complete, priority-ranked or cost-ranked list of all changes that would be required. See "How to Create Distrust," Point Lookout for May 18, 2011, for a catalog of other behaviors that erode trust. Would you like to see your comments posted here? rbrenDHuEtNgOSTAwwWYqner@ChacSGSoCyXmxFXtkIOIoCanyon.comSend me your comments by email, or by Web form. In virtual or global teams, conversations can be long, painful affairs. Settling issues and clearing misunderstandings can take weeks instead of days, or days instead of hours. Here are some techniques that ease the way to mutual agreement and understanding. When people relate stories at work, what seems important to one person can feel irrelevant to someone else. Being subjected to one irrelevant detail after another can be as exasperating as being told repeatedly to get to the point. How can we find a balance? I offer email and telephone coaching at both corporate and individual rates. Contact Rick for details at rbrenVrSBrWFvYTPUgTskner@ChacWNCMLnsSPCqYNaqEoCanyon.com or (650) 787-6475, or toll-free in the continental US at (866) 378-5470.